The Code ($15, ISBN: 978-1-937536-79-4, Hardcover ISBN: 978-1-68114-132-9, LCCN: 2014945159, 6X9″, 126pp, July 2014; Buy on Amazon or Barnes and Noble; also available in Kindle: $2.99): When Abe Josef gets arrested for assaulting a college student and loses his scholarship to prestigious Tower University he wants to blow up the entire city. Since the “suits” from Tower think Abe’s capable of violence he plans to become their worst nightmare. But, gangsters prove even less loyal than PhDs and he ends up facing years in prison for manslaughter. Abe’s only allies come from unexpected places, an over-looked classmate, a small posse of street-writers, an ancient letter, and his own family. 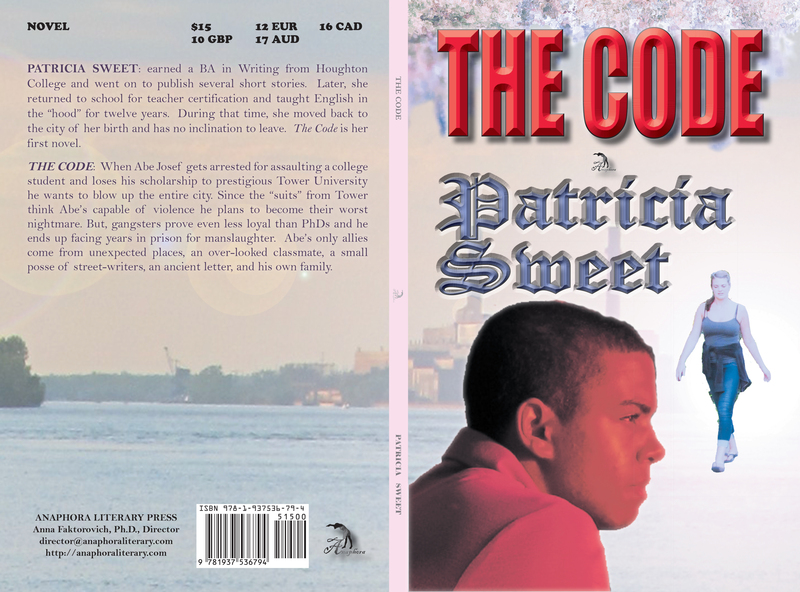 Patricia Sweet: earned a BA in Writing from Houghton College and went on to publish several short stories. Later, she returned to school for teacher certification and taught English in the “hood” for twelve years. During that time, she moved back to the city of her birth and has no inclination to leave. The Code is her first novel.